Many diners enjoy the taste of sauteed zucchini and onions served at Japanese hibachi restaurants. Chefs at Japanese hibachi restaurants transform cooking into performance art by preparing your meal in front of you on a large hibachi grill. The stars of a teppanyaki dinner are usually the meat dishes prepared over an open flame, but zucchini and onions are almost always prepared as a side dish for the meal. Most restaurants make the zucchini on a teppanyaki grill, which has a flat iron surface -- and you can easily re-create the dish at home with a cast iron skillet. Slice off each end of a small, tender zucchini; leave the skin intact. 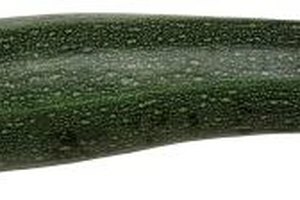 Slice the zucchini in half lengthwise and crosswise to make four roughly equal pieces. Then cut the zucchini into strips roughly the size of a fast food-style French fry. Cut an onion into slivers roughly 1/2 inch wide and 2 to 3 inches long. Preheat a cast iron skillet over medium-high to high heat. Toast sesame seeds in the pan for about 1 minute or until golden brown. Remove the sesame seeds and set them aside. Line the bottom of the skillet with butter or sesame oil. Heat the skillet just until the oil begins to smoke. Brush a bit of sesame oil on the zucchini and onion slices as well, to add flavor and prevent the vegetables from sticking to the pan. Add the onion to the skillet and cook, stirring frequently, for about 3 minutes or until the onions soften and begin to turn translucent. The onions take longer to cook than the zucchini, so cooking them for a few minutes before adding the zucchini ensures both vegetables finish at the same time. Add the zucchini in with the onions, and stir to combine. Season the vegetables with salt and pepper to taste. Fry the zucchini and onions for about 3 minutes or until they're medium golden brown. Stir the vegetables constantly while frying to prevent sticking. Transfer the zucchini and onions to a plate. Garnish with a sprinkle of the toasted sesame seeds. The zucchini and onions are usually eaten with only salt and pepper, but you might add a sauce such as soy, miso or teriyaki just before removing the vegetables from the grill to add more flavor. Use just enough sauce to lightly coat the vegetables so the sauce doesn't overwhelm the dish.